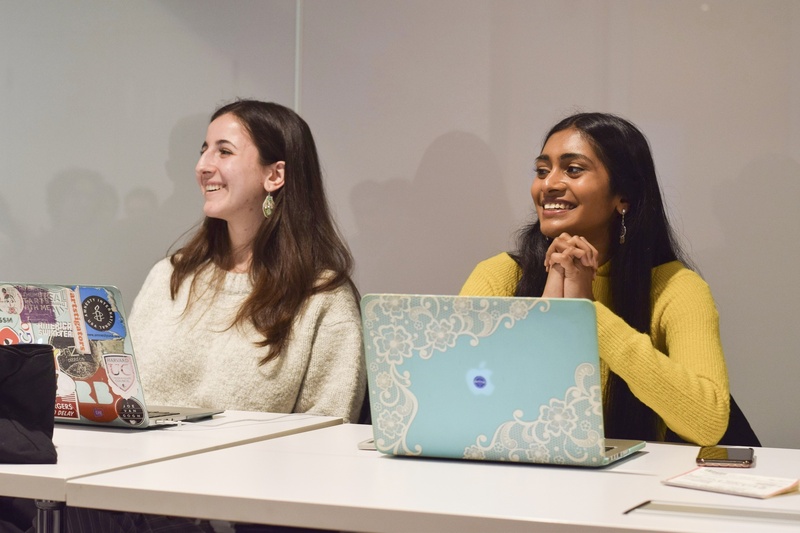 Sruthi Palaniappan '20 and Julia M. Huesa '20 lead a Undergraduate Council meeting in March. The Undergraduate Council voted to fund an electric scooter sharing program, a music and comedy event, and a promotional video for a freshman pre-orientation program at its weekly meeting Sunday afternoon. Pforzheimer House Representative Athena W. Kan ’19 and seven other council members, most of whom represent houses in the Radcliffe Quadrangle, requested $3,000 from the UC’s burst funding to support Scoob, an electric scooter sharing company run by Nestor O. Tkachenko ’21. The company currently owns and operates two scooters on campus, which students can rent via an app. They applied for funding from the UC as well as other Harvard sources to raise enough money to purchase roughly 20 additional scooters, according to Tkachenko. In the pilot program, Scoob will only operate within the Harvard campus, but scooters will be available for all to use. Harvard students will be given a subsidized rate of 50 cents to begin a rental plus 10 cents per minute, while non-Harvard students will pay a $1 flat rate plus 50 cents per minute, according to the proposal. By granting this money to Scoob, the UC ensured priority for Harvard students when scooters need to be charged. By downloading an additional app, users can see when scooters are low on battery and be reimbursed for charging scooters. The UC logo will also be placed on the scooter and “prominently placed” within the app. Dunster House Representative Janani Krishnan-Jha ’20 also proposed legislation to fund “Laugh Tracks: A Night of Music & Comedy with JR De Guzman,” a project co-sponsored by a capella group Harvard-Radcliffe Veritones and improvisation group Three Letter Acronym Improv. Krishnan-Jha said she planned the event to help improve the accessibility of professional careers in comedy in response to what she sees as a lack of inclusivity in the comedy scene at Harvard. “There are a few exclusive organizations on campus that bring a lot of professional comedy writers and actors and performers to only their exclusive spaces,” she said. The event's planners requested $2,600 to ensure free admission to all interested students, covering JR De Guzman’s performance fee in full. Guzman is a musician and comedian who has appeared in comedy specials on Netflix, Hulu, Comedy Central, and MTV. The event is currently scheduled for April 29. The UC also granted $500 to the First-Year Retreat and Experience to create a promotional video to help the group advertise to incoming freshmen. FYRE, a new freshman pre-orientation program targeted toward under-resourced students, launched in August 2018. Multiple projects also received funding through the Grant for an Open Harvard College, which provides funding for activities that address certain “compelling interests” delineated by the UC. These projects included Identities Fashion Show’s Coco Rocha Modeling Bootcamp, the “Covenant of Love” concert taking place during the Arts First festival, the Global Health and Leadership Conference, and the India Business Summit.